The Northern Troupials or Venezuelan Troupials (Icterus icterus) are large members of the "New World Oriole" family that mostly occur in northern and central South America. However, some subspecies are found in the northern and eastern extremes of the South American continent. 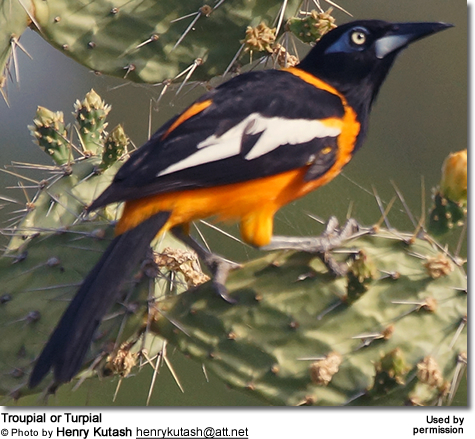 The Campo Orioles or Campo Troupials found in Argentina, Bolivia, Brazil, Colombia, Ecuador, Guyana, Paraguay, and Peru. All of which were then simply referred to as Troupials. They are now considered different species based on the fact that there have been no records of them interbreeding. This national bird of Venezuela are valued as tourist attraction and promote national pride. These striking birds are commonly kept as pets. The Venezuelan Troupials are found in Colombia, Venezuela, and the Caribbean islands of Aruba, Curaçao, Bonaire and Puerto Rico. They inhabit dry areas, such as woodlands, dry scrubs, open savannahs, llanos (vast tropical grassland plains) and gallery forests. Three subspecies are currently recognized with distinct ranges. Occur naturally in the Llanos region in northeastern Colombia and the area between the coast and Amazonas and in northern and central Venezuela, from the state of Carabobo east to Sucre, to southern Monagas and northern Bolívar to western Apure. ID: Orange neck collar, separating the head from the back. Coastal northern Colombia, in the department of Guajira, and the northern areas of Cesar; east to the lowland areas of northwestern Venezuela, east to the state of Sucre and Margarita Islands; as well as occurring in the Netherlands Antilles on the islands of Aruba and Curaçao. ID: Similar to the nominate race in terms of plumage pattern. However, generally stronger and larger than the other subspecies. Has a longer, bulkier bill. The form found in Aruba have a darker shade of orange compared to birds occurring on the island of Curaçao. ID: Less black / more orange on the back than other races. A black line divides the lengthwise white wing-stripe in half. An orange neck collar extends further up the back of the head to the hind crown, as well as a little further down the nape. A patch of orange can be seen on the lower back when the wings are closed. These large birds have long, wedge-shaped tails and long, chisel-like bills, with a grey lower beak and a black upper beak (mandible). The plumage has a sharply contrasting bright orange and black pattern. The head is black, extending to cover the neck and the upper chest. The plumage below is orange from the abdomen to the feathers on the underside of the tail. The mostly black wings have a patch of orange (epaulet) on the upper extreme of the shoulder and a white streak running lengthwise on the wing when in a closed position. The eyes are yellow, and surrounding each one, there is a patch of bright, blue, naked skin around the eye and at the base of the bill. Resemble adults, except duller orange pattern and a hint of brown on the brown feathers. The bare skin around the eyes is dull blue-grey color instead of the bright blue skin of the adults. Troupials mostly feed on insects and a variety of fruit, such as the fruit of giant cacti: mango (Mangifera indica), kenepa (Melicoccus bijugatus), sapodilla (Achras zapota), soursop (Ammona muricata), papaya (Carica papaya), dates (Phonix dactylifera) and malphighia cherries (Malphigia). They also take eggs and small birds. They are also seen at bird feeders. Troupials maintain monogamous pair bonds and remain together throughout the year. Most breeding occurs between the months of March and September in South America, except in Venezuela, where they mostly nest from May through June. In the Antilles, they may nest throughout the year. They don't construct their own nests; instead they take over the nests of other birds - such as the nests of Common Thornbirds (Phacellodomus rufifrons) or Great Kiskadees (Pitangus sulphuratus). These nests may be vacant, but they will also take over active nests and eat any eggs and hatchlings. Once they have taken over a nest, they will fiercely defend it against intruders. They will adapt these nests to their own needs by adding their own nest linings or increasing the width of the entrance. They produce about 3 - 4 whitish-pink eggs with dark spots around the bottom. The hatchlings appear after about 15 - 16 days of incubation; and they fledge when they are about 21 - 23 days old. Their loud, piping songs consists of 2 to 3 individual notes within each repeated phrase. They are similar to those of the Baltimore Orioles (Icterus galbula) and are heard in the early morning hours and throughout the day.